The long exposure and the “higher” ISO permitted me to capture quite more light from the foreground, which actually was pitch black. I loved how the clouds were moving, it almost gives it a nordic lights look. I’ve been meaning to post this picture for a while but since I changed computer I hadn’t installed Photoshop and this picture definitely requires some photoshopping. Yesterday I finally got the new Photographer package of Creative Cloud for $10 a month and went through a few tutorial videos from Serge Ramelli to rapidly get started. The results are pretty satisfying. Hope you enjoy it as well. It was the first time in Disney World for my son who had just turned 2 – he was very very impressed, but mainly with Mickey Mouse. While getting there and back I had some time to read up on Walt Disney’s views on the world some of his original plans for EPCOT and the control of experience. I must admit it changed my look on Disney. 22 Sep	This entry was published on September 22, 2013 at 7:15 pm. 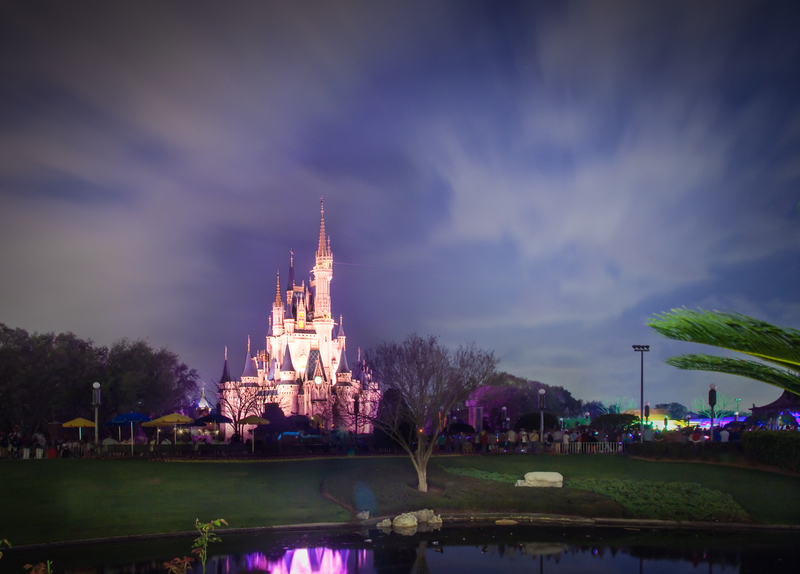 It’s filed under Buildings, Canon 5D Mark II, HDR, Landscape, night photo, Parc, photography and tagged castle, disney world, HDR, night, park. Bookmark the permalink. Follow any comments here with the RSS feed for this post. Very cool photo! The EPCOT information is interesting. Thanks a lot for the comment and observation. I try to use the HDR just as a means to recovering as much light as possible and not to give it the “HDR Look” but all looks can be great if it makes the image interesting and pretty.